When it comes to Jester Skull Canes, there are two schools of thought. The more traditional school is serious about jester skulls, writing them into plays, for instance, so that the main character can make contemplative speeches about life and death. But more modern attitudes toward jester skulls are a little less reverent. 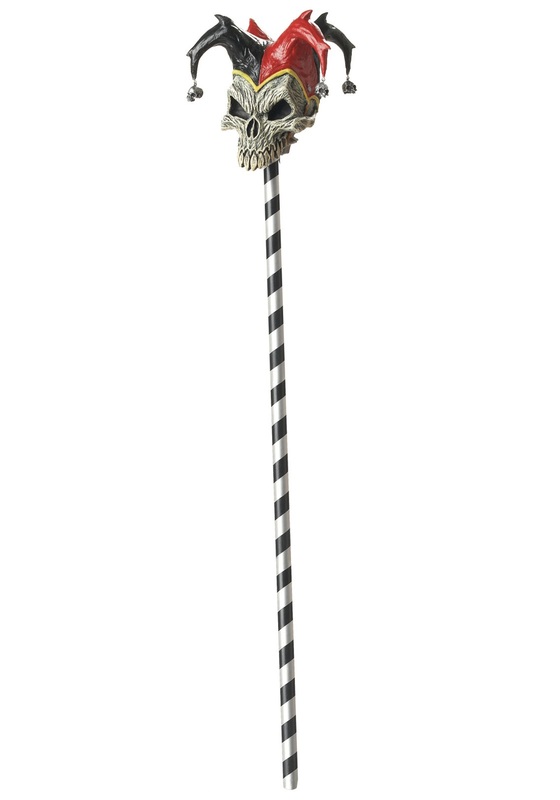 That's why this particular Jester Skull Cane gets to be so much more fun! Ashes to ashes, and to everything there is a season, and so on. But wouldn't a normal skull cane be enough to make most people to slow down and ponder life's mysteries? Why would you need to add a diabolical jester's cap and hypnotic black-and-white striping for that? You wouldn't! So this isn't your grandparents' Jester Skull Cane. It's a sinister baton made for a wicked-looking agent of chaos and lover of mayhem, or the unrepentant ringmaster of a high-octane thrill circus!